Step 5 invloves attaching the lower longerons into place. February 25, 2000. Here is the lower longeron clamped into place on the right fuselage side. Lots of cuts were made to allow it to conform to the curves. 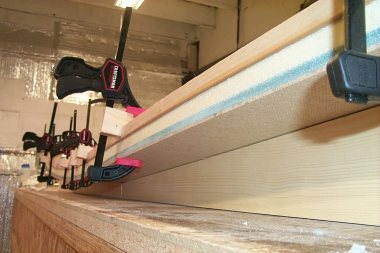 To get the clamps to hold the triangular longeron nice and flat against the side I tried several ideas. The one that I used worked very well and only took about 20 minutes extra to do. I cut small blocks of wood and placed a triangular notch that matched the longeron. I made sure the blocks would stay out of the way of oozing flox. February 25, 2000. Here is the aft end of the lower longeron. 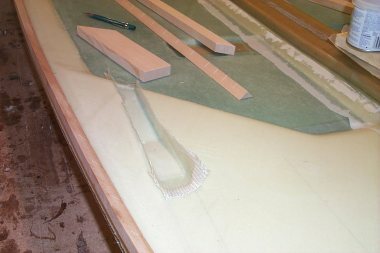 You can se all the cuts to help go around the aft curve. I made cuts every inch at the end. February 25, 2000. 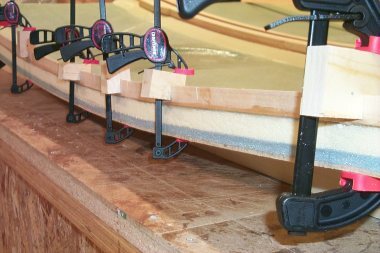 Here is a good shot of the clamp jigs I made. February 25, 2000. 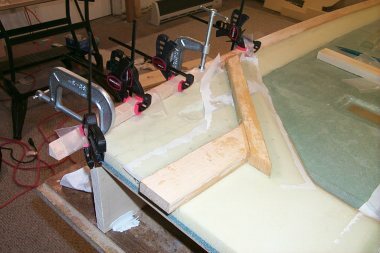 You can see that the longeron overhangs the edge of the foam just a bit. After measuring the proper location based on figure 5-5 I had only a few spots with just a small amount of overhang. 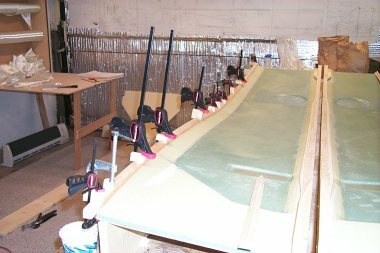 Since all the foam gets carved round to the fuselage I should be fine. February 27, 2000. Here is the electrical channel after adding the layer of BID. This will get trimmed smooth. February 28, 2000. The lower longeron, LWX, and LWY being floxed into position. The BID tape has been applied to LWX and LWY. 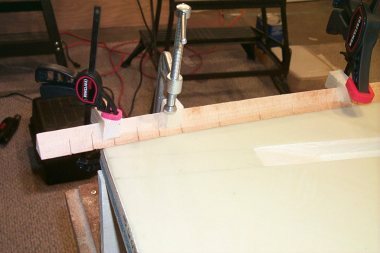 Peel ply has been applied to the tape edge.